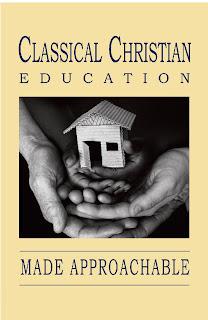 If there were only ONE book that I could recommend to parents who are either thinking about Classical Conversations or who are new to CC, it would be Classical Christian Education Made Approachable. I have loaned out my copy of CCEMA sooo often! It's a short, to-the-point explanation of the Classical Christian method of home education and Classical Conversations. I LOVE it and recommend it all the time! Please click here to read some great quotes from this book (really, go check it out; the quotes will get you so pumped about Classical Christian education!). Classical Conversations was kind enough to donate TWO copies of this amazing little book as giveaway prizes! Enter below and I'll announce two winners on Saturday. This giveaway is open to U.S. residents only. I was just about to purchase this book! We will start homeschooling in the fall and are so excited! What helped in our decision to go classical was Susan Wise Bauers book on classical education! I have been WANTING this so much!!!! I haven't read this yet. Love this book, and actually have lent my copy out to a friend and have a few more friends on the "waiting list". It would be great to have a second copy to share! Thanks, Melody! New to CC, so I haven't this yet. Would love to win a copy! Oh, just read the question we are supposed to answer. There are lots of great books on "how to" homeschool. Several are in the CC catalog. Having homeschooled for over 10 years, I'd highly recommend a little book called Homeschooling with a Meek & Quiet Spirit by Teri Maxwell. http://www.titus2.com/homeschooling-with-a-meek-and-quiet-spirit.html The principles in that little book have helped me abundantly over the years. "The Core" by Leigh A. Bortins has been best resource thus far. Just starting out. I honestly feel a little uninformed...I don't have any books to recommend because I haven't read any! I just liked the material and the way the kids were learning it. My friends actually showed me their CC material last year...we weren't even participating. I liked it so I just jumped in! So I would enjoy getting some background info. Reading The Core helped me a lot. It was an easy read and gave real-life examples to help me in my own teaching. 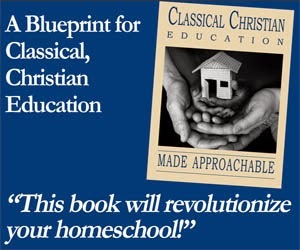 I haven't read much on classical christian homeschooling, so I don't really have a "go-to" book to recommend! I'd love to win a copy of this one! :) Thanks! I recommend The Core. It makes CC and homeschooling doable! I know I still need to read The Core... I have had it recommended to me.. and have yet to read it still. I tutor for CC and love to have books to share with others. I don't have these yet. Loved The Core and Well Trained Mind. Thanks for the opportunity! I started with The Well Trained Mind and really began to understand the classical method. But The Core made me realize that I COULD do it as well. So I recommend both. I haven't read CCEMA yet but from what I hear, it is also a must read. Thanks for the great giveaway and for all the time you put into your blog. I look to it weekly (if not daily) for inspiration. I am still through the WTM, it has been so enlightening! Thank you! We jumped into CC this year with no real guidance (at 4 years old), and I'd love to get ahold of this book to get a better picture of what I could be doing in the future. I loved The Core and have read through parts of WTM - would love the chance to read CCEMA.